Education Secretary Betsy DeVos. Photo: Oliver Contreras-Pool/Getty Images. 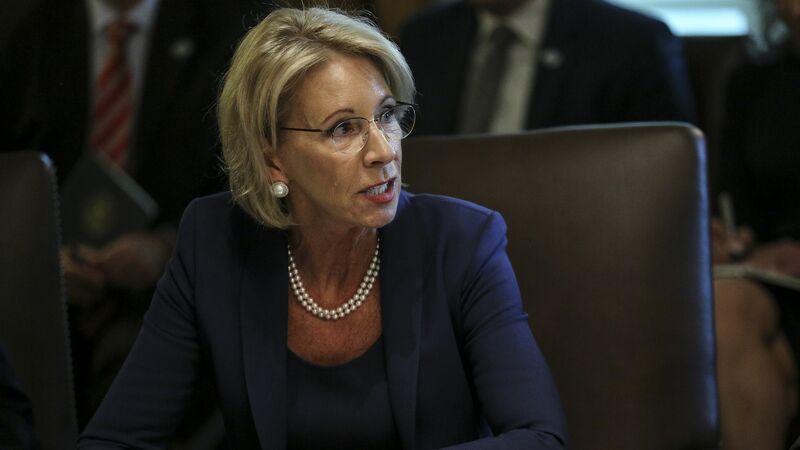 Education Secretary Betsy DeVos is slated to release new rules for how colleges and universities should handle sexual assault allegations on campus, including new rights for the accused like the ability to cross-examine their accuser, the Washington Post reports. Why it matters: The new regulation is the latest sign of a backlash against the #MeToo movement, particularly in the Trump administration. Brett Kavanaugh's confirmation to the Supreme Court after his assault allegations divided the country, and President Trump said it's a "scary time" for young men in the U.S. who face false accusations. The details: The new rules, set to be released before Thanksgiving, would erase the guidelines the Obama administration put in place in 2011. The accused would have the right to cross-examine their accusers through an attorney or adviser, though the proposal will include language barring questioning about an accuser’s sexual history, The Post reports. The definition of sexual harassment would be tightened. Universities' liability would be reduced, and they would be accountable only for formal complaints filed through proper authorities, per The New York Times, which got a look at an early version of the proposal in August. Schools could use a higher standard in evaluating claims of sexual harassment and assault. There would also be more flexibility for universities to offer more support for victims like schedule changes or housing reassignments. What to watch: The proposal to let the accused — or at least their attorney — question the accuser is likely to be the most controversial change, with one advocacy group leader calling it an "extraordinarily cruel process" that would discourage women from reporting assaults.